HP RDX 1TB Disk Cartridge Promotion Extended til October 31, 2012 - Get a FREE HP RDX Docking Station with purchase of HP RDX cartridges! For a limited time, BackupWorks and HP make it easy to get a FREE RDX USB 2.0 external docking station. Buy HP RDX removable Disk Cartridges and we'll give you the HP RDX USB 2.0 Docking Station absolutely FREE! Hurry, this offer only lasts until October 31, 2012. The HP StorageWorks RDX Removable Disk Backup System delivers an easy to use, affordable and rugged data protection solution for workstations and entry level servers in your small business. Backups are simple and pain-free with drag and drop file access. Protect your entire system with "hands free" HP RDX Continuous Data Protection Software. Reduce cost of ownership with long lasting removable disk cartridges and a forward and backward compatible docking station that does not require a costly and disruptive upgrade to accommodate future higher capacity cartridges. The RDX Removable Disk Backup System offers fast disk based performance with the ability to store 160 GB, 320 GB, 500 GB, 750 GB or 1 TB of data on a single removable disk cartridge at speeds of up to 108 GB/hr. Portable, durable and rugged removable disk cartridges simply and securely store your backups off site for complete data protection and peace of mind. Q: What is the BackupWorks HP RDX Promotion (September 15, 2012 - October 31, 2012)? 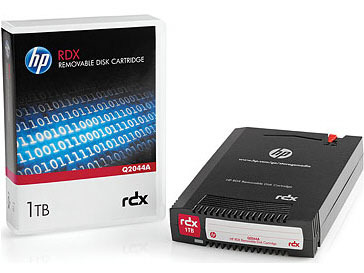 A: Purchase the following HP Disk Cartridges and receive a FREE HP RDX External USB 2.0 Docking Station. A: The Promotion is effective from 12:01am, PST, September 15, 2012 until 11:59pm, PST, October 31, 2012. ALL ORDERS MUST BE PLACED BY October 31, 2012. NO EXCEPTIONS. A: Order Min. quantities or more based on capacities above and we will revise you order to include the FREE docking station, or call their BackupWorks Rep at 866 801 2944.